Apple said at WWDC it would build a more integrated and comprehensive two-factor security system into its next OS releases, and today explains what that means. Two-factor authentication systems can deter or defeat attempts to log into accounts remotely, as an attack has to not just have a password, but also access to a device, computer, or phone number belonging to the target account. This turns hacking from “wholesale” to “retail”: unless a flaw is found in the underlying system, each protected account has to be cracked one at a time. As in the existing system, you have to set up at least one—but up to any number—of iOS and OS X systems as “trusted devices.” These appear in a list in your Apple ID account and can be removed from there, as well as in OS X in iCloud system preferences, by clicking Account Details, and in iOS 9 in Settings > iCloud > Account. You also have to verify at least one phone number as a backup. The current system, labeled “two-step” by Apple, requires an (ironic) extra step during login. When you log in at an Apple site that supports two-step now, after entering an Apple ID account name and password, a pop-up dialog or screen of some sort prompts you to select a trusted device or trusted phone number to which a four-digit code is sent, and then enter that code in a following step. Starting in OS X 10.11 and iOS 9, you won't have to pick a trusted device to send verification codes to. While Apple doesn’t specify it here, in the current system only some Apple sites and systems require two-step. Apple developers; users of its iTunes Connect system for book, music, and app uploads; and other sites allow access with just an account name and password, even for two-step-enabled accounts. This is likely to change as part of this integration, as these are all holes that can be exploited by wily crackers. The current two-step method will continue to work indefinitely, so as not to lower security for older users nor break systems. 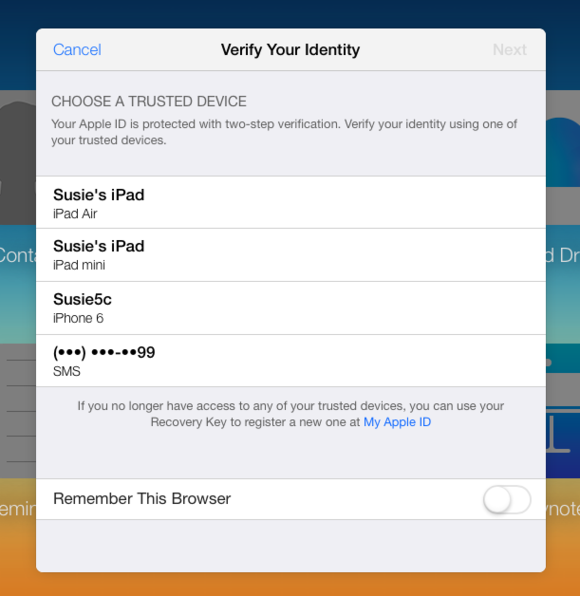 When using iOS 8 or earlier or OS X 10.10 Yosemite or earlier, a verification field won’t appear. Rather, after attempting a login with the Apple ID and password, and having the verification code appear on trusted devices, a user will then need to log in again appending the six-digit code at the end of the password in the password field. Only El Capitan and iOS 9 devices will display six-digit codes. Without it, the data and purchases associated with that ID were lost for good. 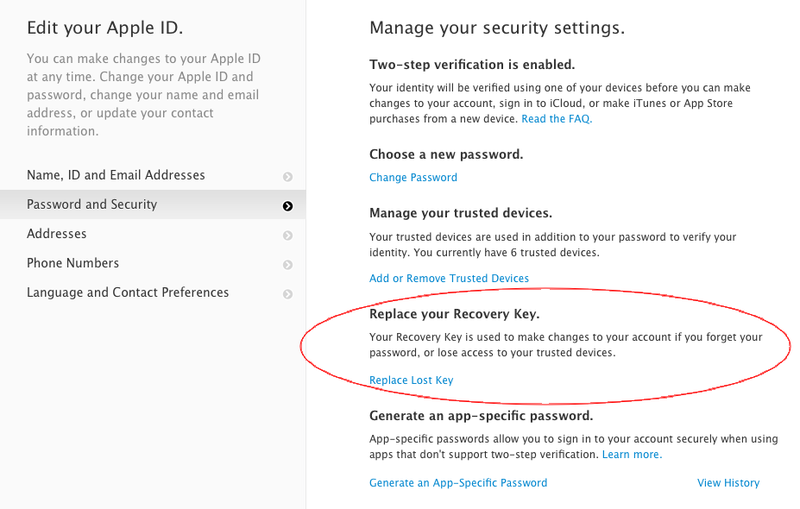 This could also be triggered if Apple decided your account was under attack and reset your password. 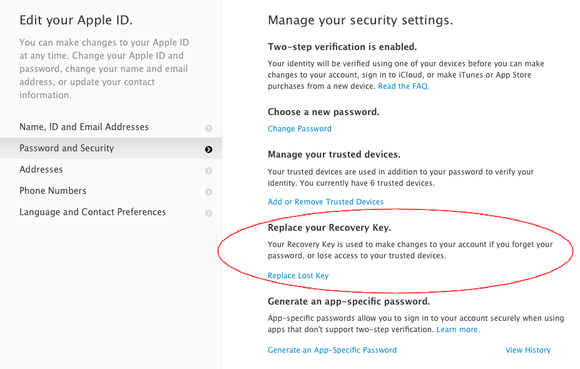 Some reports indicated that Apple’s customer service could reset accounts without the Recovery Key, but it seemed to be available only in limited cases and with support’s discretion. The process described in the FAQ should help overcome social engineering and identity theft, widely described as ways in to user accounts at many sites over the last several years. Apple will get in touch via a “verified phone number,” which one assumes is one associated with your Apple ID account—it’s worth noting that one can associate multiple numbers there. There’s a process that’s loosely described as having one’s case reviewed, and then needing to provide detailed information to prove you’re the rightful owner of the Apple ID account. “The process is designed to get you back into your account as quickly as possible while denying access to anyone who might be pretending to be you,” the FAQ notes. If an account is eligible, a user will be alerted after signing in with an Apple ID on a public beta in the Setup Assistant. 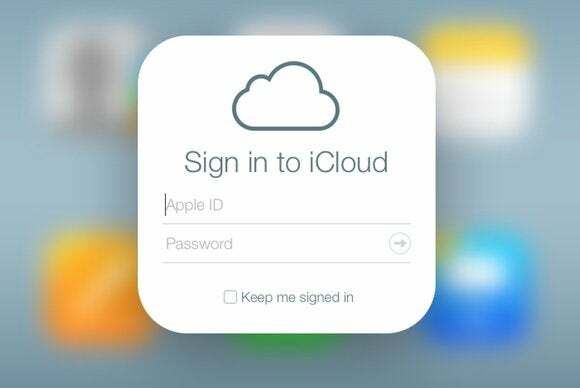 Apple says users will see a “two-factor authentication” screen if they can opt in.